World Breastfeeding Week (WBW) is celebrated annually in more than 170 countries to encourage breastfeeding to improve babies’ health and help prevent death among children under five. Although the World Health Organization recommends that all infants be exclusively breastfed for the first six months of life, this does not always happen. According to the 2011 Demographic Health Survey in Bangladesh, exclusive breastfeeding rates decrease from 84% at less than 2 months postpartum to 36% at less than 6 months. The WBW 2013 slogan, Breastfeeding Support: Close to Mothers, in Bangla. National inauguration ceremony: The Health Minister, the Honorable Prof. Dr. A.F.M. Ruhal Haque, attended the inauguration ceremony as a chief guest, along with the State Minister and the Health Advisor of the Prime Minister as special guests. The Health Minister said, “The aim of the breastfeeding week was to facilitate peer support for mothers to sustain breastfeeding and inform people of its benefits. Breastfeeding within an hour of birth can prevent 31% of neonatal deaths in the country. Exclusive breastfeeding (feeding infants only breast milk) in the first six months after birth can prevent 13% of under-five deaths.” Asserting the government’s success, he said the rate of exclusive breastfeeding during the first six months had increased to 63% in 2011 from 43% in 2007. The MoHFW, the Institute of Public Health Nutrition, and the Bangladesh Breastfeeding Foundation observed the week through awareness campaigns. Rally and discussion meeting: SPRING/Bangladesh jointly arranged a colorful rally and discussion meetings with district health and family planning officers, along with GoB Administration Officers at all SPRING/Bangladesh areas in the Khulna and Barisal divisions. The respective MoHFW offices led the rally event and chaired the discussion meeting. Honorable speakers of that meeting reinforced the need to emphasize exclusive breastfeeding, breastfeeding counseling and health education at various community contact points. Rickshaw rally with placards: SPRING/Bangladesh, the MoHFW, and partnering NGOs organized a rally with placards displayed in Barisal. A Union Facilitator carried a placard containing messages conveying the advantages of breastfeeding. 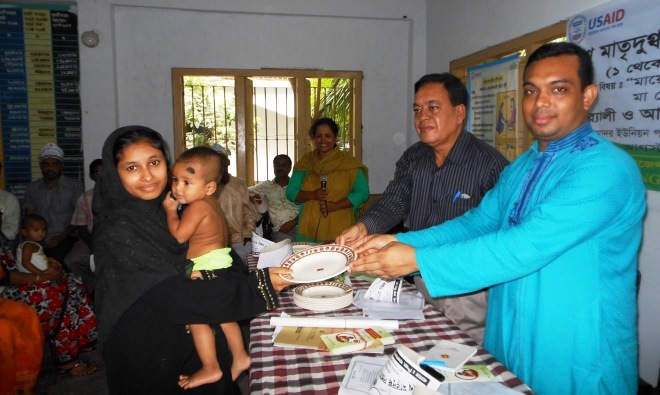 Breastfeeding Corner: A “breastfeeding corner” was another initiative that took place at a health complex in Khulna. Lactating mothers were counseled by the medical officer and nurses and given a practical demonstration of proper breastfeeding techniques. 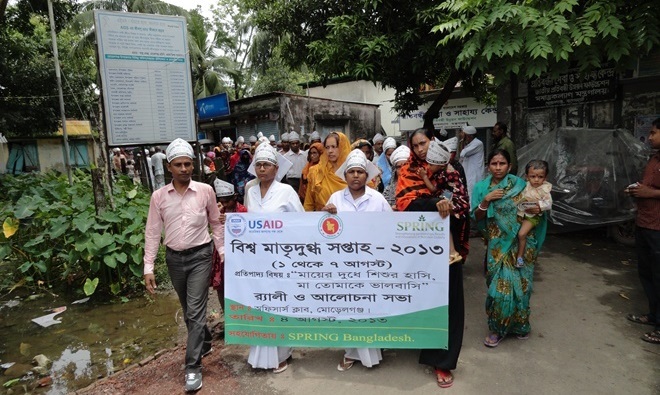 SPRING/Bangladesh, along with partnering NGOs, provided technical assistance and logistical support to the health department. Hanging Roadside Banners: Twelve roadside banners bearing the theme of WBW were hung in various important locations in Khulna. 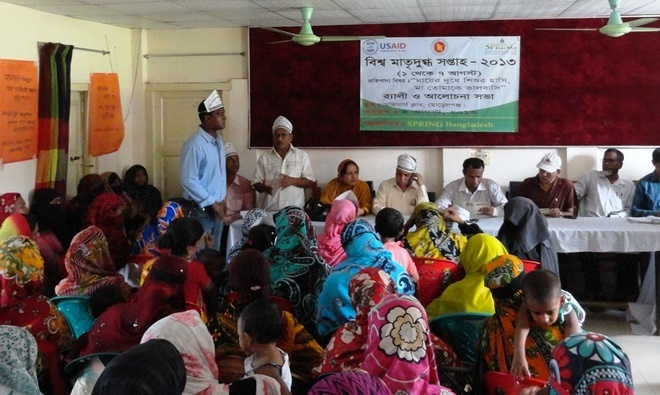 Promotion/Milking: Breastfeeding messages were also disseminated in each of the communities in Khulna. 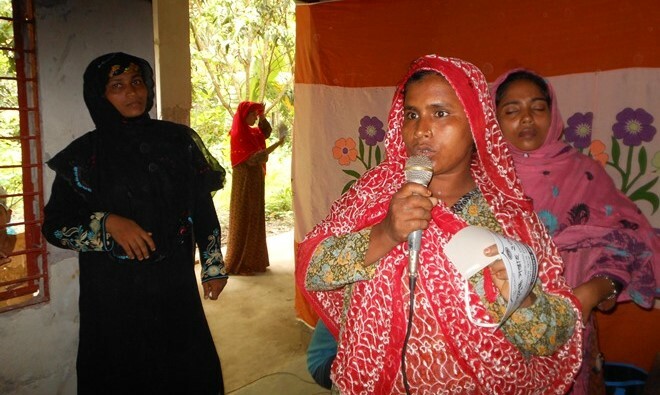 Theater and folk song: SPRING/Bangladesh arranged a theater skit and singing groups in a few areas within Khulna to reach the larger community with breastfeeding messages. Breastfeeding Session in Farmer Field Schools and Award Ceremony: All farmer field school sessions, in both divisions, conducted a special session on exclusive breastfeeding. At the end of each session, the group identified mothers who were practicing exclusive breastfeeding and rewarded them with a small gift for their good practices.